Dan Mullen gets to start his first season in Gainesville against the same team he started his last season in Starkville against. And let the 2018 game previews begin! All time series: Florida 1, Charleston Southern 0. Last meeting: Florida 62, Charleston Southern 3 (2009). Who are they? For the second straight year, the Buccaneers get to play the role of Dan Mullen’s season opening sacrificial lamb. Charleston Southern is the Gators’ latest bit of shameless season-opening schedule padding, although after what happened last year in Jerry’s World that may not be a bad idea. Anyway, it’s hard to believe the Gators won’t be a significantly better football team in Year One of the Dan Mullen era than they were last year. Whether the 2018 Gators are indeed significantly better than the 2017 Gators is a debate that will have to be put on hold for at least one game, though, because that’s the kind of team Charleston Southern is. Do not put any stock into Florida based on what you see against the Buccaneers. 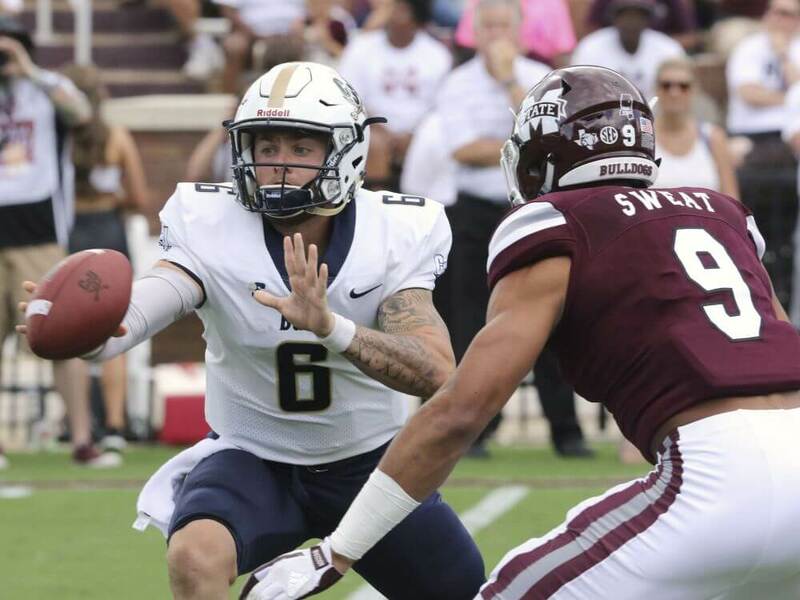 Offensive breakdown: Shane Bucenell produced just 15 yards through the air in the 2017 season opener against Mississippi State, and thus began a furious QB battle fought with grass blades and seat cushions with London Johnson that never actually did get settled. Of the two, Bucenell (737 passing yards last year) is the “better” thrower, and Johnson (581) is the “better” runner, but neither of them figured out how to guide an offense. Those two, plus Jack Chambers, will compete for the starting QB job. Or maybe the blame for the Buccaneers’ anemic offense should be spread out more. The running game never got going, either. Names to keep an eye on with the Bucs’ ground game include Adam Allen, Jamari Dunbar, and Chanin Hamilton. How afraid should Florida be of these three? You tell me; they totaled zero SEC offers as recruits and 132 yards last year behind departed starting tailback Noah Shuler. CSU will have a pair of seniors in Saire Davis and Kenny Dinkins, and a junior in Kameron Brown to catch passes from whoever wins the starting QB job. But the bigger question will be blocking for that QB. The Bucs surrendered 20 sacks in eleven games last year, and two of them resulted in safeties against the Mullen and Grantham led Bulldogs. Offensive Grade: F. Mark Tucker has his work cut out for him here, for sure. But even if he can mold this unit into something respectable, it isn’t going to happen by their first game of the season. They’re in for a long night in the Swamp. Defensive breakdown: For all the struggles CSU will have to labor through on offense, there’s promise on the defense. At least, if you ask the Buccaneers coaches. Defensive linemen Johnny Robinson, Eishaun Funnye, Anton Williams, Shaundre Mims and Jacob Garibay can all play and thus can be rotated around at different positions. At linebacker, Charleston Southern will look to J.D. Sosebee and Edward King to help stop the run, something they actually did well last year. The problem was that they got burned through the air whenever opponents really needed some big yardage, and stopping the run in that case ultimately does you no good. The Buccaneers feel good about their secondary this year, though. CSU returns a trio of rising senior defensive backs in Jonathan Slaton, Shadarius Hopkins, and Brandon Rowland. Now cue the “but they didn’t have offers from SEC teams” line, because, well, they don’t. And sorry to get repetitive, but that goes for everybody on this defense. Defensive grade: D. Charleston Southern will have a solid defense that’s capable of keeping the Bucs in the hunt for the Big South title. That does not equate to a defense capable of stopping an opposing offense littered with four and five star players that are bigger, stronger, faster and more athletic than them. Florida key to victory: don’t show up drunk. Trust me, these keys will get much more into X’s and O’s when the time comes to preview the real opponents. Charleston Southern key to victory: shorten the game with long, slow, punishing drives that eat up eight minutes of clock apiece and conclude in the end zone. Which with the enormous talent disparity is like asking them to cure cancer: sure, it’s possible, but let’s agree that it’s considerably more likely that it doesn’t happen. Fun fact: For all the years he terrorized SEC foes in the special teams game, it was against Charleston Southern that Brandon James, the most lethal return man in Gator history, got his lone kick return touchdown that wasn’t called back to a penalty. Summary: Nothing you’re going to read here or anywhere else is going to convince you of anything other than your deeply preconceived notions about Charleston Southern, so I won’t attempt to. Jeremy Foley scheduled them for a reason. Do not use anything you see from Florida’s offense as a basis for your prediction about their potential growth during the year, though, particularly at the QB position. This is a warm-up, a preseason game, a tune-up, and thus not a performance in which it’s wise to put a lot of stock- unless of course things go horribly wrong. But it’s really difficult to foresee the game playing out in any way that ends up with Charleston Southern winning, and what’s likely to be more interesting than the game itself is how Dan Mullen rotates his quarterbacks. In fact, he may outright host an open audition between Feleipe Franks, Emory Jones and Kyle Trask in this game, the end result of which is far less predictable than the outcome of this game. Bottom line, Florida wins comfortably, resets its season opening win streak to one, and everybody is happy. The season begins in earnest the week after.